I can hardly believe that the school year is coming to an end already. One of our biggest challenges at home during the summer is limiting screen time. Left to their own devices my boys would be absorbed in YouTube videos and video games all day long. 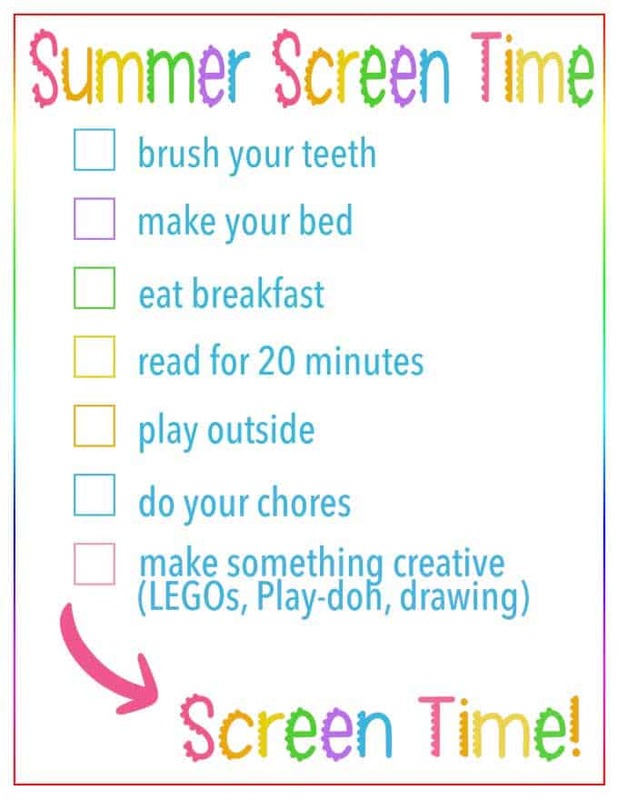 In order to keep screen time in check, I made this Summer Screen Time Rules printable and thought I would share it with you too! In our home we make our boys read, play outside, and do their chores before having screen time all year long. In the summer I add in their morning responsibilities as well. I also like to add in a creative challenge. Somedays I’ll challenge them to create a particular LEGO build, or draw something challenging. Just a little something to keep them creative before the screens come out! If you need help downloading and printing these printables, please watch the video below for a step by step tutorial. Are your kids as screen-obsessed as mine are? How do you limit screen time in your home? I agree with your list, just the comment at the end implying that any screen time is negative. I have honed my logic skills from playing games. I totally agree that screen time can be educational or useful Liz! We do a lot of Khan Academy and my oldest loves to code with Scratch. It’s just that left to their own devices they’d spend quite literally all day long watching other people play video games on YouTube which isn’t quite the type of screen time I’d prefer!